Cats vs. 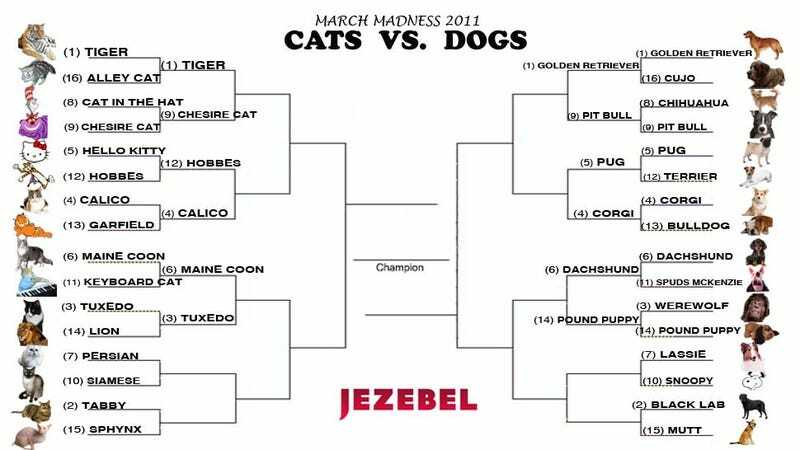 Dogs: A Major Upset! We're down to the last few days of the first round of play — but exhaustion has yet to set in for these fierce warriors. Today is a day of sentimental favorites, but at the end of the game, a mammal must fall. Grab your toothbrush, because this one's going to leave a bad taste in your mouth. The King of the Jungle is not, it would seem, the king of March Madness — yesterday Lion fell at the paws of Tuxedo cat. And in a major upset, the sharp-toothed Werewolf (no. 3 seed) was no match for the plush comfort of the 14th-seeded Pound Puppy. Children of the late 80's and early 90's unite. We anticipate this being a close one, given the popularity of these two breeds. Do you prefer funny-faced fluff or a sleek classic? It's like pitting Anthropologie against J. Crew — both are kind of pricey but generally attractive. The story of a boy and his dog can be irresistable — but when forced to choose, which more fiercely pulls at your heartstrings? There's no wrong answer here. Per usual, polls close at 3pm EDT tomorrow. So what's it gonna be?